Awhile back, in January, I promised to treat Anita to a meal. Due to mitigating circumstances, it never came to fruition (ooo... I'm using big words! That University education really paid off...). As such, I've been trying to get her out for the last half year. Our schedules just never seem to coincide for this to happen. Although, it could be that she is just trying to avoid me... Fortunately, that was not the case and finally, we settled on a time and place. For the longest time, I've been wanting to give Rangoli a go. You see, I'm am very fortunate to be near some of the best (and cheapest) Indian food in the GVRD. Thus, I am very curious how Rangoli stacks up. We must keep in mind that Vij puts his own spin on Indian food. Those looking for the usual items, may not find it. I arrived a bit early and was forced to wait because our whole party wasn't present. Yes, when a restaurant is so successful, not only do they not take reservations, they won't seat you unless everyone is there. I guess that is fair. That is the exact policy at Vij's as well. You can't imagine how excruciating it is to watch all the tables fill up right in front of your eyes? LOL... When Anita arrived with R, we only had a brief wait. You see, Rangoli is not exactly a place to linger since the seating arrangements are not exactly posh. The minimalistic "Ikea-like" decor is functional, if not, uncomfortable. Well, that is the concept since it also doubles as a take-out store which offers prepackaged food. We stated the meal sharing the Lamb, Beef & Lentil Kebabs. As the name implies, it consisted of 4 "sausages" comprised of ground lamb and beef with lentils. Date-tamarind chutney was served on the side. I really enjoyed this appetizer. There was no absence of flavour when I bit into the moist, meaty kebabs with definite hits of fennel and garlic. 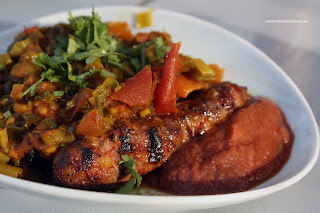 The chutney acted as a nice sweet counterpoint to the savory and slightly spicy kebabs. For my main, I went for the Lamb in Cumin and Light Cream Curry. Hidden beneath peppers and onions lay a decent amount of tender lamb. Naturally, there was a good amount of cumin; but it was not overwhelming. I found the flavours to be subtle and not too heavy. As with Vij's, I'm not a huge fan of the naan. I find it a bit dense and doughy. Anita ended up with the Tamarind and Yogurt Marinated Grilled Natural Chicken. This was another mild-tasting dish. I thought the chicken was quite tender with only a hint of tamarind. I found the sprout salad to be quite good, if not for being something different. 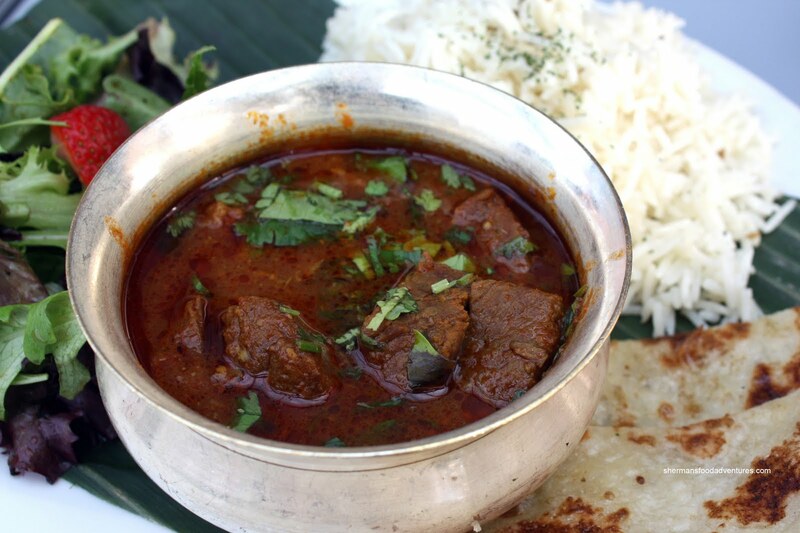 We thought the best of the dishes we ordered was the Beef in Puréed Onion and Cinnamon Curry. It was bold tasting with a definite onion and ginger flavour. I only got a hint of the cinnamon which elevated some sweetness. Although the serving bowl was small, it was packed with tender chunks of beef that had soaked up all sauce. Since we weren't completely stuffed from dinner, we went ahead and ordered dessert. Much like Vij's, Rangoli is not known for their desserts; so there are only 3 options. Well, we all had a different one and covered them all. Anita decided on the Meeti Roti which reminded me of fry bread with hits of gooey sugar throughout. Nothing particularly exciting about the dessert itself; yet it was pleasant enough to eat and good for sharing. For myself, I had the Rice Pudding with some slivered almonds on top. Only semi-sweet with discernible grains of rice, the pudding was slightly watery. Once again, nothing mind-blowing. It was alright. I liked the crunchy almonds, it provided a nice textural contrast. 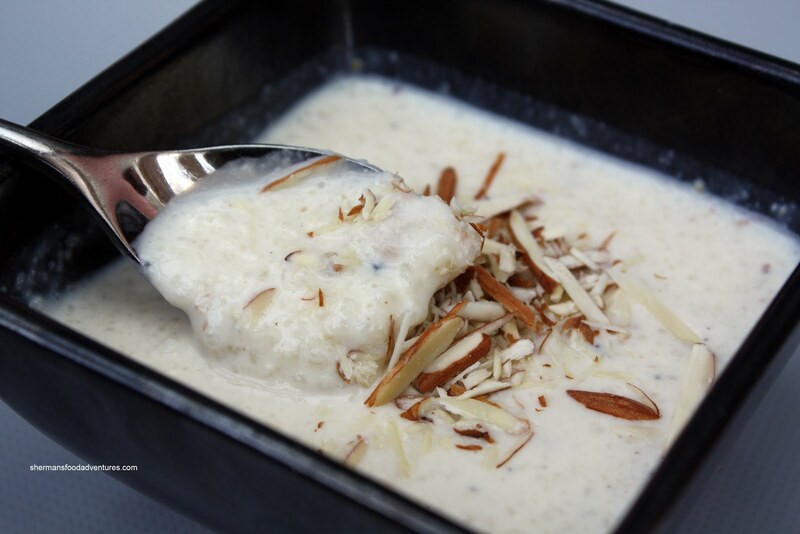 Lastly, R had the Coconut Pudding. When it arrived, the pink colour confused us a bit. I guess we were expecting white. 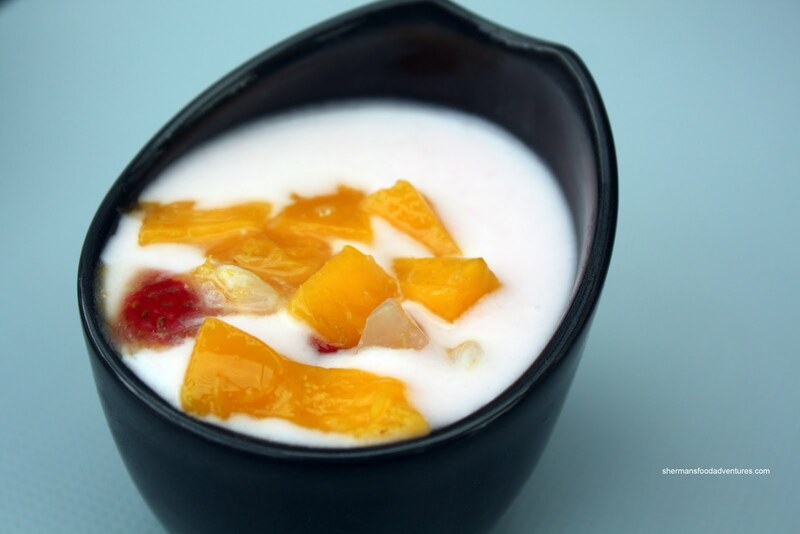 Topped with fruit, this dessert was very refreshing, if not a bit boring. I didn't notice a strong coconut flavour personally. Although the food wasn't spectacular by any stretch of the imagination, we were pleased with our meal. Sure, the prices were on the higher side; however, it is not unreasonable considering the location and compared to other Indian restauran ts in the area. In terms of the portion size, it is indeed modest. Once again, that is not unusual for an Indian restaurant. 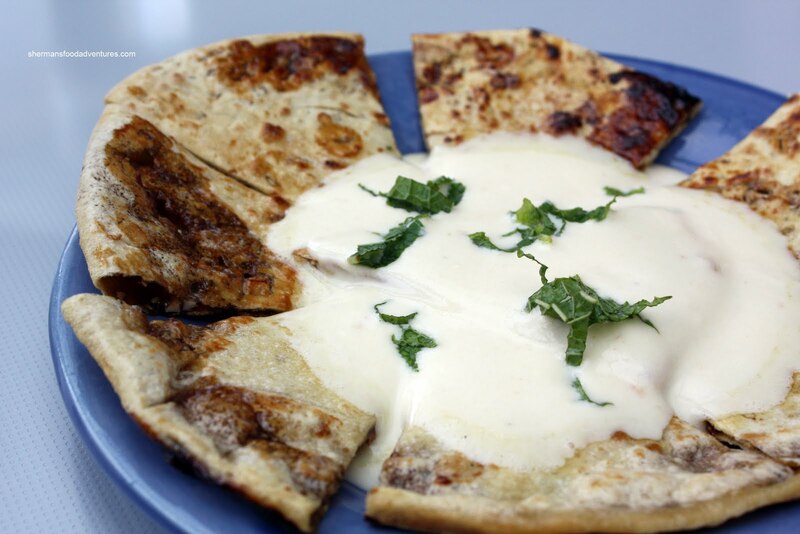 Usually a little sauce is enough for the amount of rice and naan provided (think pasta sauce). If push came to shove, I probably would eat at any one of the Surrey Indian restaurants instead for half the price. 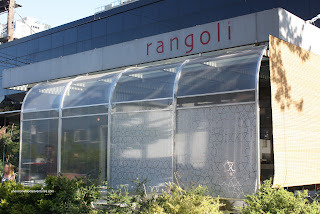 But, if you are specifically in the Granville area and don't mind spending the money, Rangoli serves up some tasty food. 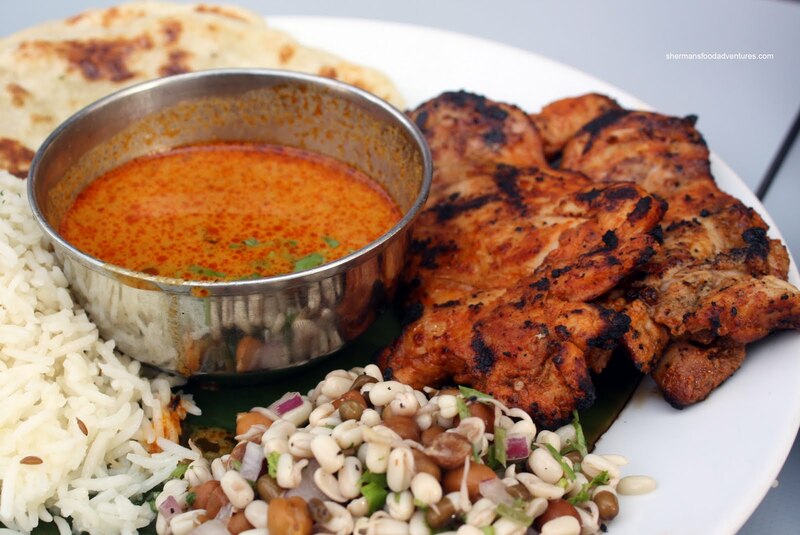 do you have any suggestions about cheaper good indian food around the vancouver area? i haven't been able to find that many. 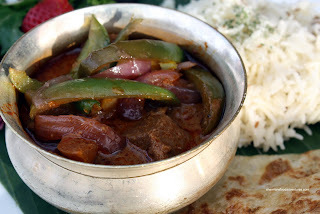 For me, the cheapest and best Indian food is in Surrey. However, there is Tandoori Kona in Richmond. Personally, I like Bengali Fish & Curry in Surrey. It's cheap and pretty good. Rubina's in the Granville Island Food court is tasty and cheap. They offer a discount if you go about a hour before closing as well. I love their thali dishes. Thanks for the suggestion of Rubina's. LOL, would u believe I use the stock 18-55mm lens on a Canon XSi?